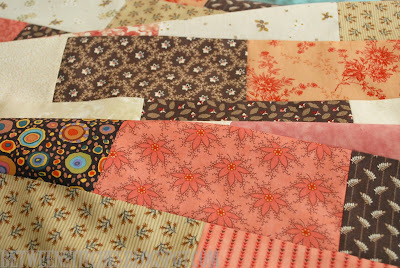 A little quilt I made during a fun workshop this past Saturday to make a quilt top in a day using a brick layout. It would have been done in that one day, but we had so much fun chatting and laughing so hard, it didn't matter. Who needs a sauna when you have a bunch of hysterically funny quilters in one room? Although the top is completed, it'll have to wait for the border fabric to arrive at the shop for me to finish it and prepare for quilting. Not a problem, as I'm heading for the finishing line of my Ann Grimshaw sampler, and have plenty to do outside of the handwork realm! Love these colors. It's going to be beautiful. Love your sampler as well. You do lovely work.